The Map and CAD View displays a background image for a work area. Topcon Tools can open only georeferenced image as a background. (Georeferencing of the image establishes the relationship between pixel coordinates and real datum/grid/ground/local coordinates). If the image is not georeferenced, Topcon Tools can calculate the relationship with the desired coordinate system. To do this, the user has to have the coordinates of the ground control points in the given coordinate system. 1. Click View > Background images. Select the desired image file in the Open dialog box, and then click Open. This image will be displayed in the left panel (Available Images) of the Background images dialog box. An unlimited number of images can be activated in this panel. 4. Select the needed background image in the left panel and click the double arrows button. This image will display in the right panel (Images used in the jab) of the Background images dialog box. If the coordinate system of the selected image is the same as the job’s coordinate system, this image will be marked with a green icon in the right panel and displayed in the Map and CAD views. 5. 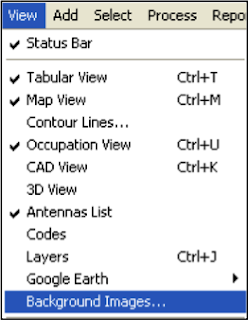 Be sure that the Show Background Map entry box is checked (enabled) for the Map/CAD View (To see this check box, right-click on the Map/CAD view, then select Option from the pop-up menu).